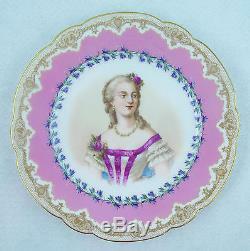 Sevres Du Barry Hand Painted Porcelain Plate. Beautifully hand painted Sevres porcelain plate made in France during the mid 19th century. The middle has a fabulous painted portrait of the famous courtesan of King Louis XV, Madame Du Barry. The plate measures approximately 9 3/8 (23.5 cm) diameter. Plate marked Château De Fbleau mark and Sevres mark for the Royal palace, 1846. Signed by the artist in front of plate. The item "19th C Sevres Du Barry Hand Painted Porcelain Plate 9 3/8 (23.5 cm)" is in sale since Monday, June 8, 2015. This item is in the category "Antiques\Decorative Arts\Ceramics & Porcelain\Other Antique Ceramics".